That Wednesday, the 3rd of March 1881, local man Thomas Stamp made his way up to the small town of St Mary's to report having found two things on the day before down at Gull Island Cove. The first was the cover of a binnacle with "Isabel of Liverpool" painted on it. The second was the body of a man with "certain initials" tatooed on right and left arm. However much the local people might have been expecting the remains of the crew to start being washed up on their shore, it must have been a bleak and shocking moment when Thomas Stamp recognised what he had found. The body was in such an advanced state of decomposition that it was deemed necessary to have it buried straight away. Properly coffined, the body was buried on Ash Wednesday at Holyrood (now St Vincent's). I am told by a local historian that in such cases, in a community such as this, a body would be buried by the local people with care and in a Christian manner in the local cemetery (See Historical Background by William Hillier on Page 6). The authorities at St Mary's fretted that a magistrate should have been consulted first so that an inquest could be held before the burial, but on closer examination of the circumstances they commended Stamp for his actions and accepted a deposition before a magistrate in the absence of an inquest. "...Around his waist was a belt sustaining a pair of trousers of new cloth, covered by an oilcloth one, inside of all being a pair of knitted drawers. The height of the body was about five feet ten." Both bodies were placed in coffins; one was interred on the 10th, and Joseph Ridings on the 11th, just as the first body had been buried back on the 3rd March. On 12 January they thought they had found the Captain. "On this day, the 12th, Thos. Stamp affirms that on yesterday he succeeded in recovering another body at Gull Island Cove, apparently 50 years of age, with iron-grey whiskers and moustaches, and supposed to be the Master of the ill-fated brigantine. Shrouded and coffined, this body was interred beside the others at Holyrood at half-past eight this morning." The information was "deposed to on oath", the deponents saying that immediate burial was necessary. 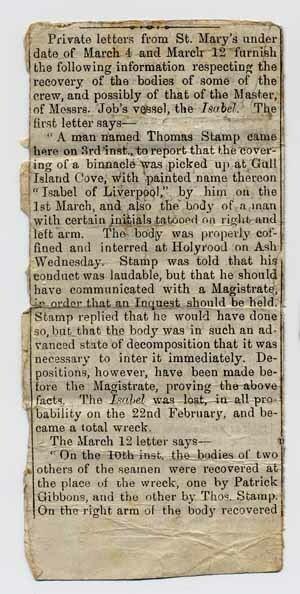 Part of the article which contained the description of what was thought to have been Captain Quick's remains. It was found folded up very very small, along with the last letters written by Captain Quick to Ellen, and all enclosed in a tiny hand-made purple silk purse. "A Despatch was received here yesterday from Trepassy stating that the bodies of four of the crew of the ill-fated brigantine Isabel, lost near Gull Island, St. Mary's Bay, on the 22nd ultimo, had been washed ashore and taken in charge by the people residing in the neighborhood of the disaster." And as with the others, the body was interred as soon as it was found. We still hope to find out what the "other evidences" were, but may never know if Quick's family were notified of this second find. The fact that the description of the first had been preserved with the captain's letters and there was no mention of the second, invites the question. I think the body Thomas Stamp found on the 11th, initially taken to be the captain, would have been the Mate, William Tucker, who was the same age as Henry Quick, also with a master's certificate, and from a similar background. They both had "iron grey whiskers".